Externals are those things that one can see. The externals of the Mass are the objects used during Holy Mass that you can see. The Church has exact regulations for all the externals of the Mass. The Altar is the most important object in a Catholic church. On the altar the Holy Sacrifice of the Mass is offered. In the tabernacle of the altar the Blessed Sacrament is kept. If possible, the top of every altar should be a stone slab. There should be five crosses engraved on this slab. The crosses represent the five wounds of Our Lord. 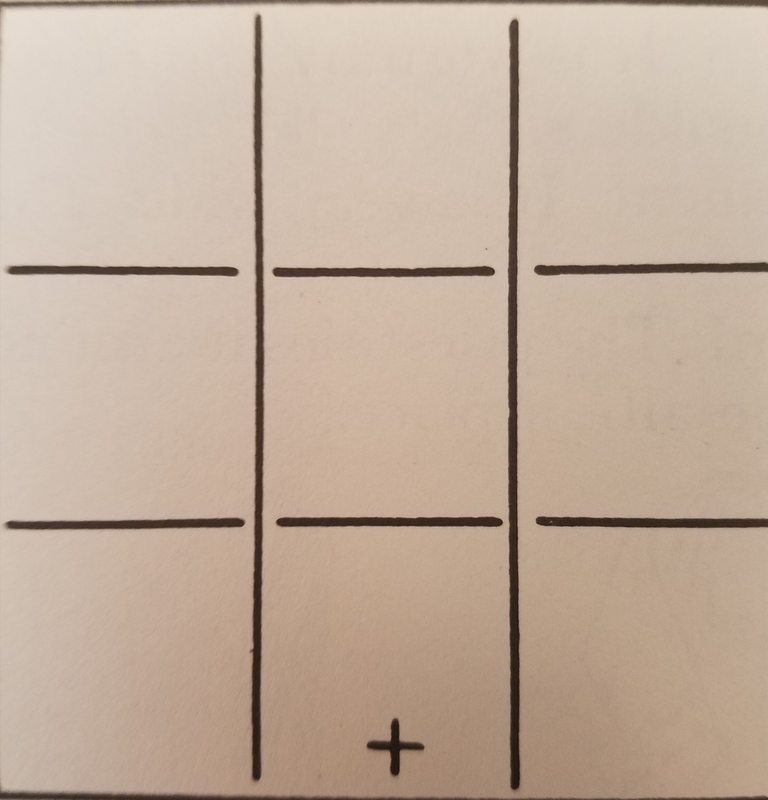 There is one cross in the center and one at each of the four corners. Sometimes, the top of an altar is not a stone slab. Then an altar stone is used. This altar stone may be as small as a large piece of tile. Five crosses are cut into the top of the altar stone. 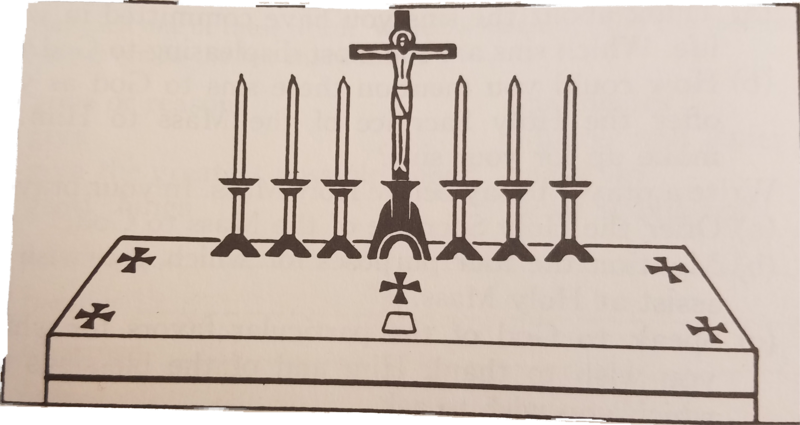 The crosses are just the same as on a large stone altar. 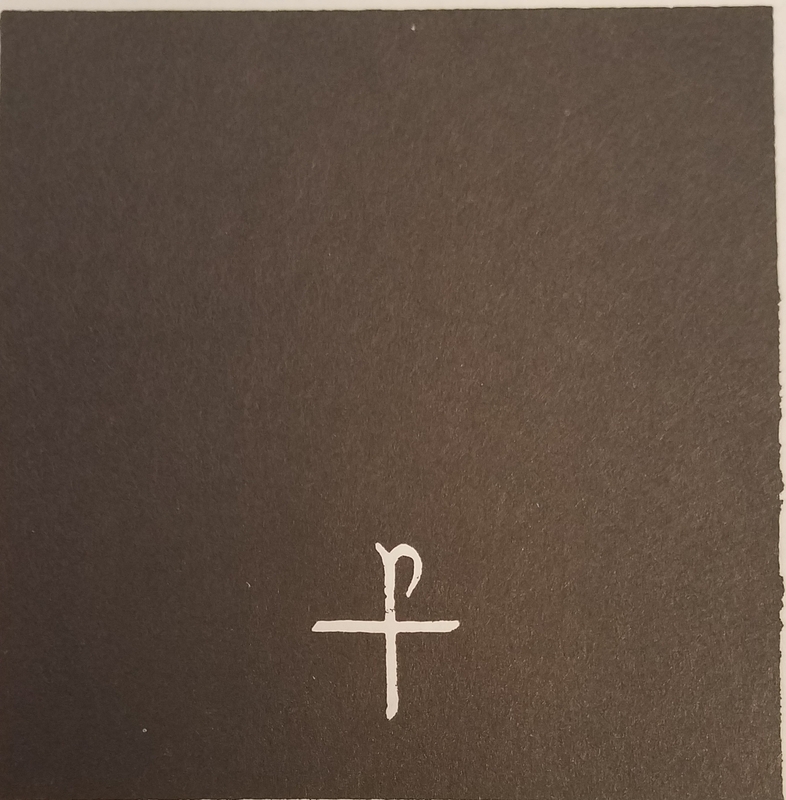 In the altar stone, or in the top of a stone altar, there is a small box. The box is made of lead. It contains relics of at least two saints who were martyrs. The altar is always covered with three white cloths of linen. The first two cloths need cover only the top of the altar. Over these cloths a much longer one is placed. This cloth reaches to the floor on both sides. It is the real altar cloth. Only three things are necessary on an altar. 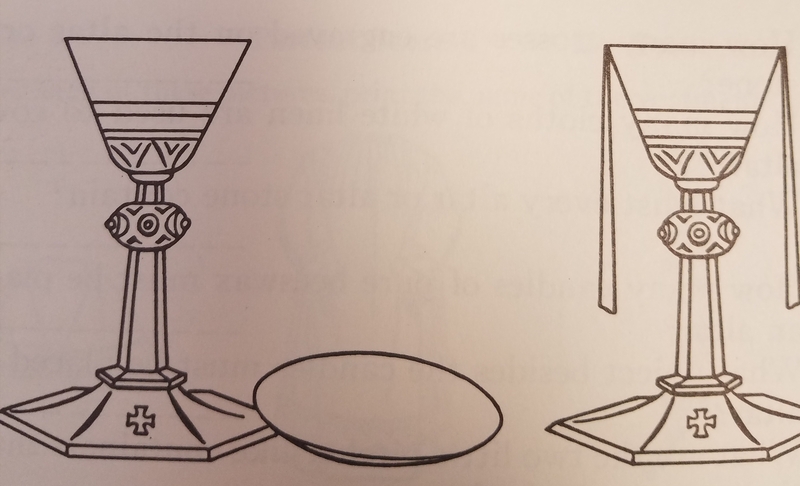 These three things are a crucifix and two candles. The candles must be made of beeswax. They are placed on each side of the crucifix. The priest reads from a large book during Holy Mass. 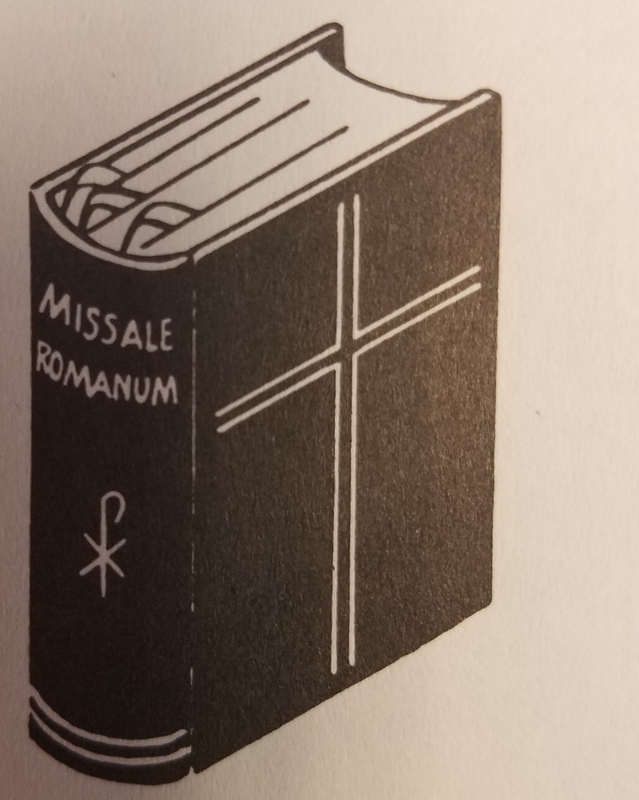 This Mass book is called the Missal. 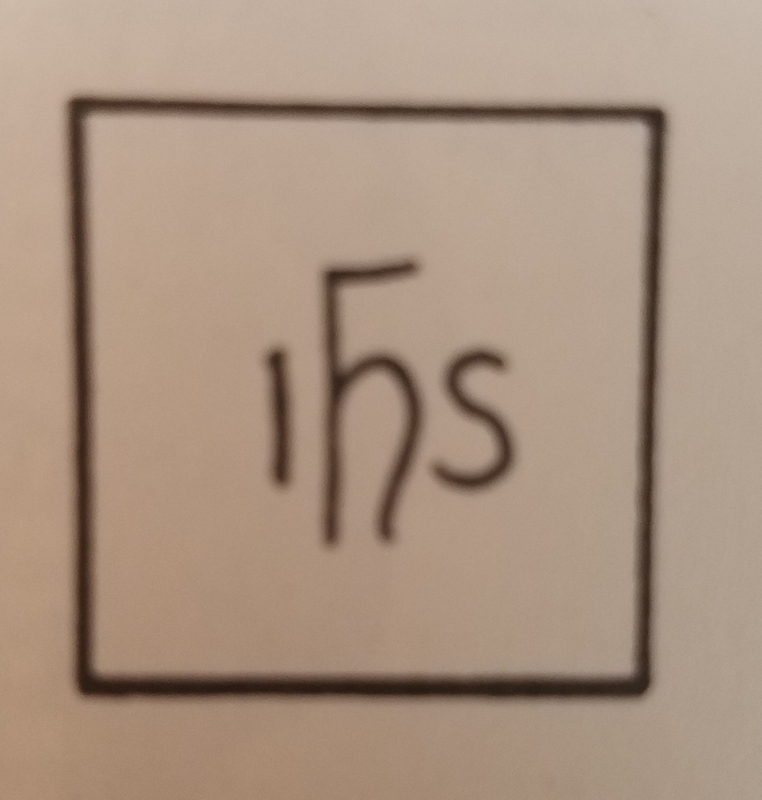 It is on the right side of the altar when Mass begins. 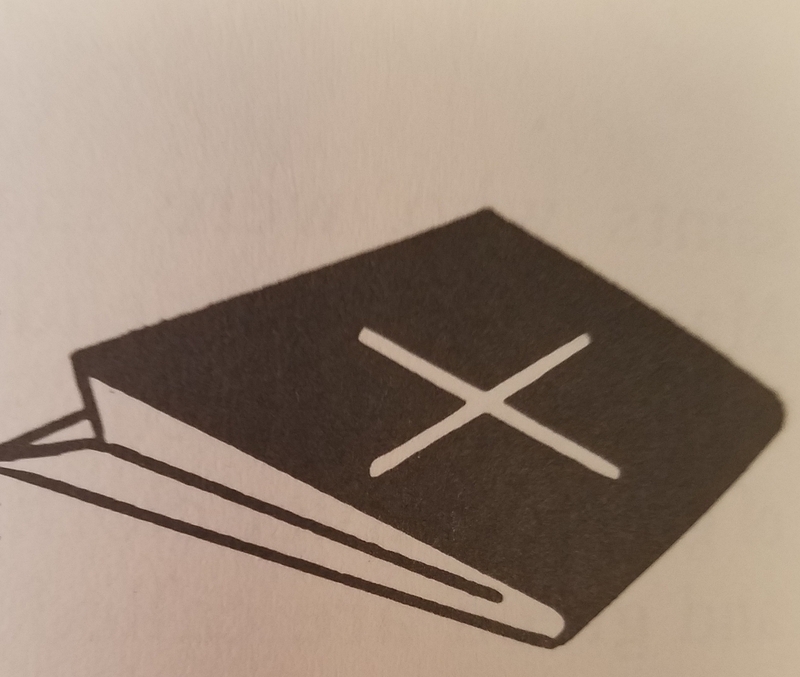 The Missal is placed on a book rest. The water and wine for Mass are put in two cruets. The cruets are little pitchers. They are used with a small dish. The cruets and dish are placed on a table near the altar. Sometimes they are placed on a shelf. When used, this little shelf is on a wall near the altar. At the side of the cruets there is a small white finger towel. This is used by the priest to dry his fingers. 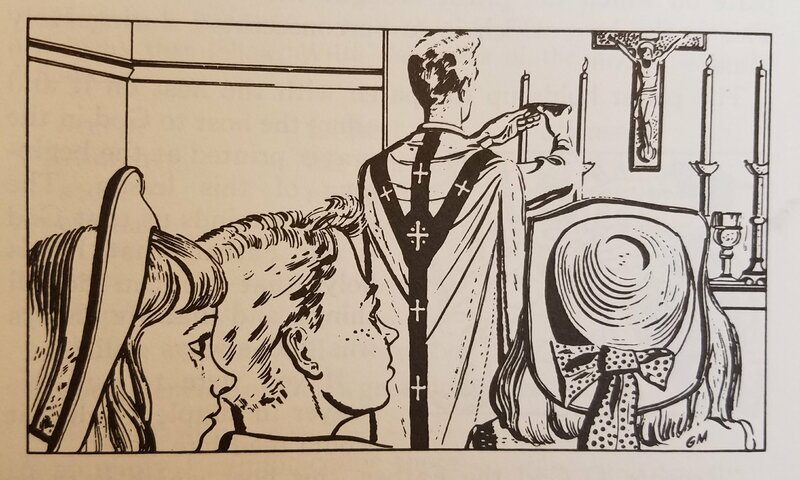 The priest is told just what he should do in dressing for Holy Mass. He has a special prayer to say as he puts on each vestment. The word vestment means a garment that is different from everyday clothes. Some vestments are plain. Others are very rich. But always vestments are dignified. They are made like clothes people wore hundreds of years ago. The priest puts the vestments on over his black cassock. The cassock is the long black garment he wears. Vestments are of two kinds, outer vestments and linen vestments. 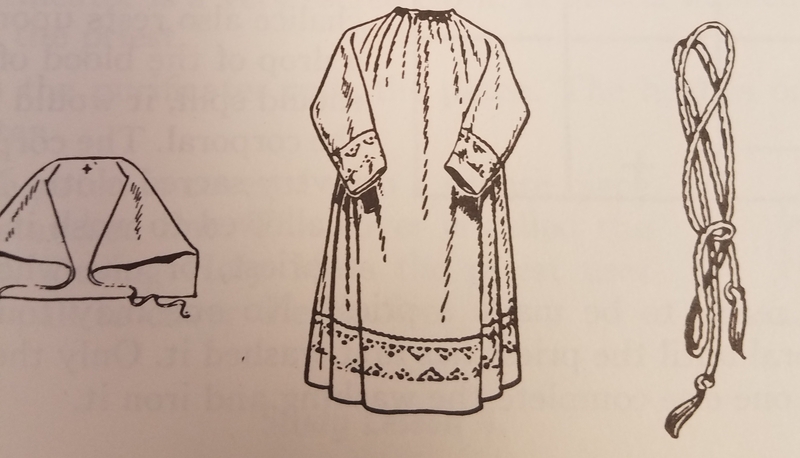 The chasuble is the large outer vestment. Long ago it was much longer. The chasuble and the other outer vestments are always the same color. The stole is a long narrow vestment. The priest wears it about his neck and crossed on his breast. 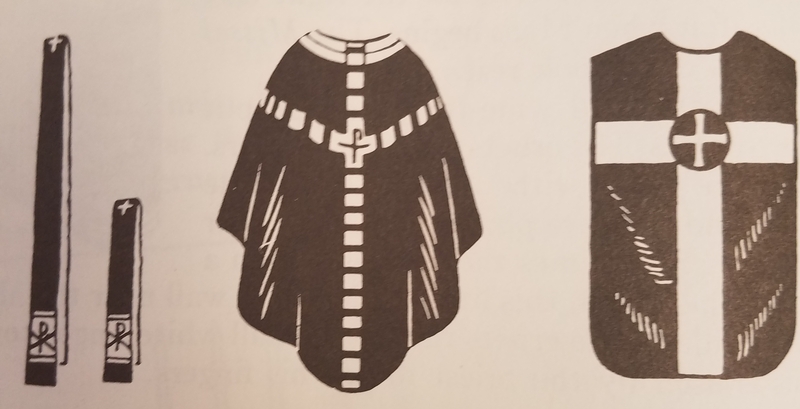 The stole worn during Holy Mass is made of the same material as the chasuble. The maniple is worn on the priest’s left arm. It also is made of the same material as the chasuble. The Church tells the priest when he is to use different colors. Violet is used during Advent and Lent. White is used during Christmas and Easter time. White is also used on feasts of Our Lord, our Blessed Mother, and for saints who were not martyrs. Red is for the Holy Ghost and for saints who were martyrs. Black is for funerals and for Masses for the dead. Green is used when no special feast is to be celebrated. Sometimes, for special days, vestments of gold or silver cloth may be used. Violet, white, red, black, and green are called liturgical colors. The amice is a white linen color. It is worn by the priest about the neck and over the shoulders. The alb is the long white vestment. It is very wide. The sleeves reach down to the wrists. The cincture is a long white cord. The priest ties it around his waist. The cincture holds the alb in place. 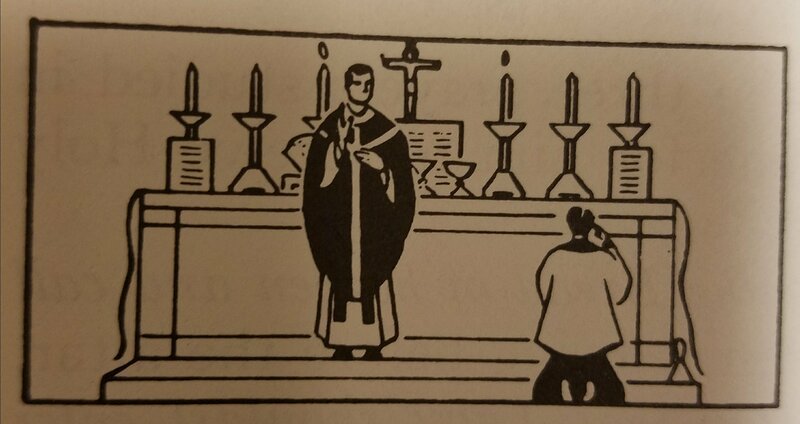 As the priest goes to the altar to offer Holy Mass, he is carrying several objects. Only the outer covering can be seen. The outer covering is called a veil. It is made of the same material and color as the vestments. 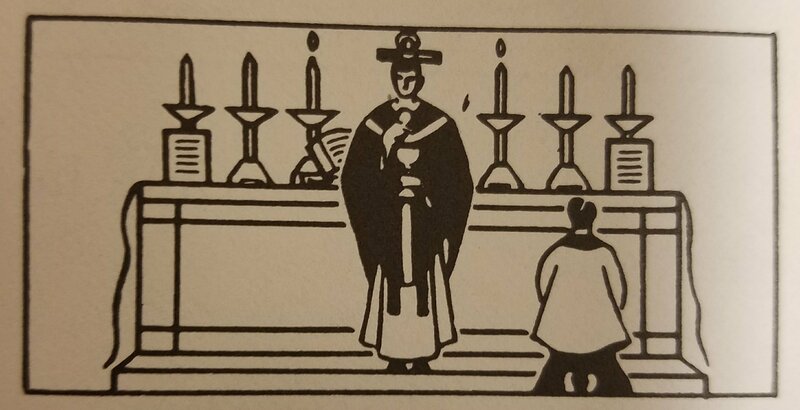 The priest places on the altar the objects he is carrying. He puts them over the altar stone. He does so gently and carefully. He arranges the veil so that everyrhing looks very nice. The burse is a hard square folder. It is on top of what the priest carries. The burse is covered with the same material as the vestments. The priest carries the corporal in the burse. The corporal is a large square of linen. Before Holy Mass begins, the priests opens the corporal. 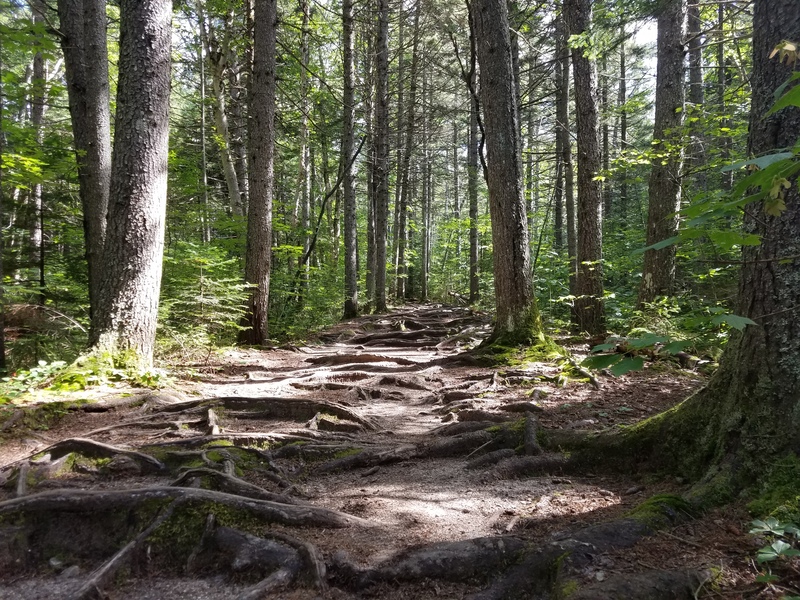 He places upon it all he has been carrying. 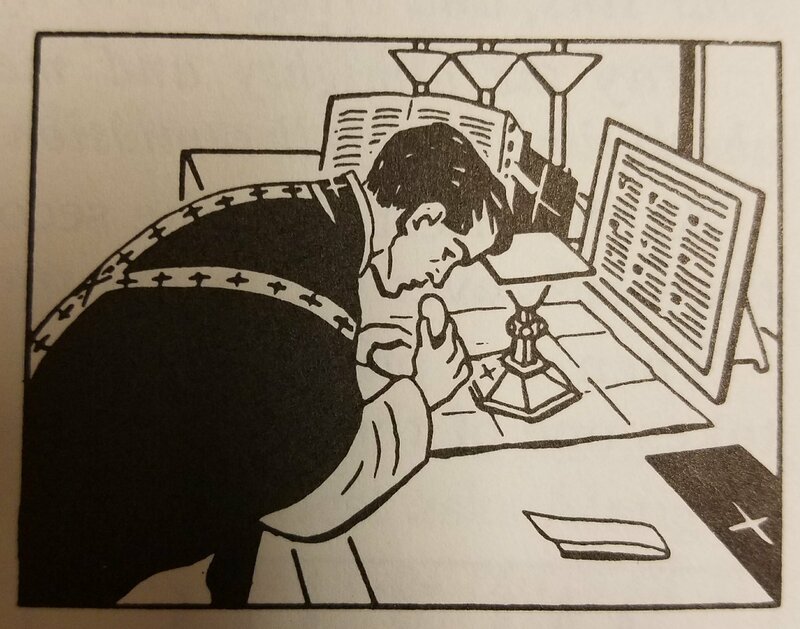 After consecrating the Sacred Host, the priest places it upon the corporal. The chalice also rests upon it. If a drop of the blood of Jesus should spill, it would fall on the corporal. The corporal is a very sacred cloth. No one is allowed to wash it except a priest, or one who is almost ready to be made a priest. No one may touch the corporal until the priest has first washed it. Only then may some one else complete the washing and iron it. The chalice and paten are under the veil. The paten is a small gold-like plate. On it is the large host. This is the host which is to be consecrated during Holy Mass. The chalice is empty. It is the scared vessel in which the wine will be consecrated. The chalice and paten are always made of gold, or of silver with the inside of the cup gilded. 1. The chalice stands on the altar. 2. A linen cloth, called the purifactor, is placed across the cup of the chalice. This cloth is folded three times lengthwise. It hangs down on each side. 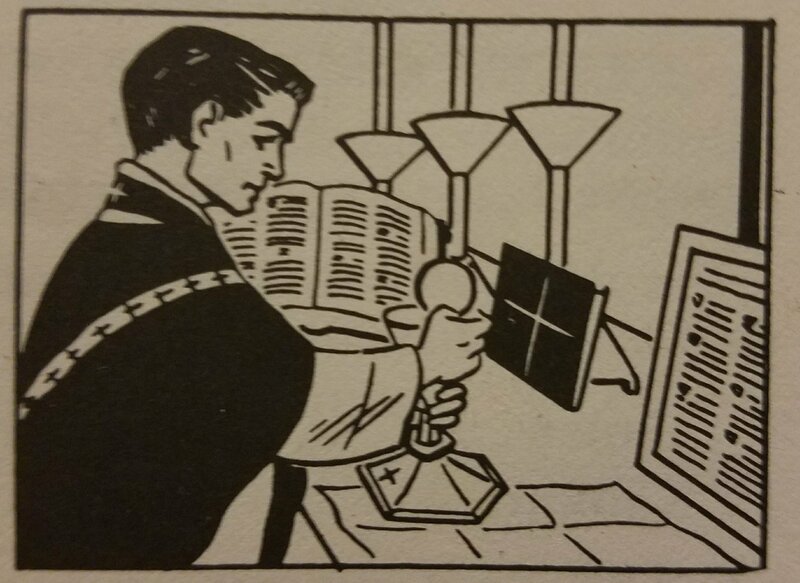 The purificator is used to clean inside the chalice. Like the corporal, the purificator is a very sacred cloth. 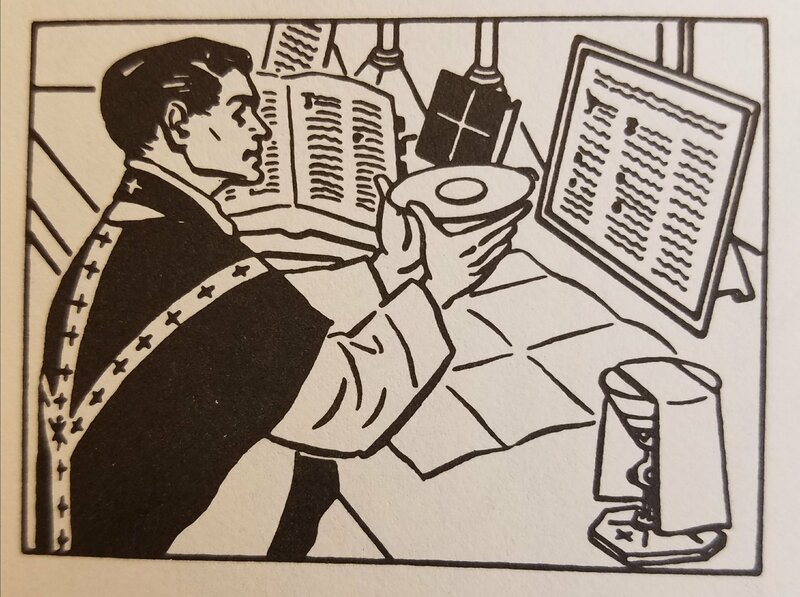 It also is washed first by the priest. 3. On the purificator rests the paten. The host is on the paten. 4. The paten is covered with a square piece of starched line. This cover is called the pall. During Holy Mass the priest uses the pall to cover the chalice.